Nike Basketball is finally set to officially debut LeBron James’ 16th signature shoe, the LeBron 16 in September. The first two pairs that are scheduled to release is the “HFR” and “Bred” iterations. Adding to the lineup will be an upcoming “Triple Black” colorway. 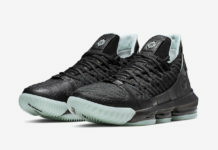 This Nike LeBron 16 features a Black Flyknit with matching Swoosh and “LJ” crown logos. A debossed lion crest logo on the heel atop a visible Zoom Max Air sole unit completes the design. Look for the Nike LeBron 16 “Triple Black” to release later this fall season at select Nike Basketball retailers and Nike.com. The retail price tag is set at $185 USD.